We offer several in-office options for Lymphatic Drainage. Pressotherapy is a form of detoxifying treatment popular in European Medi-Spas. It effectively sculpts body tissue by reducing trapped lymph and water from within the tissue. Through this very effective lymph, water and toxin drainage, we help restore the body’s naturally occurring healing functions. The revitalization and oxygenation of the tissue slims and redefines. This treatment is especially good for enhancing skin tone, increasing circulation and cellular respiration. Pressotherapy is safe, painless, and completely non-invasive. It can alleviate the pain, and swelling caused by lymphedema and provide immediate relief and comfort. Post-operative edema (post-mastectomy, etc.) and post-traumatic edema. After cosmetic surgery (essential following liposuction or liposculpture). 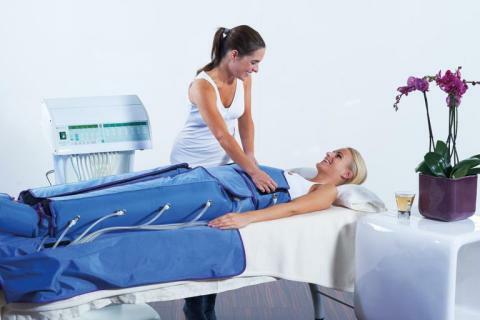 Pressotherapy is a computer controlled compression system, which utilizes precisely controlled inflating pumps. The device includes five separate chambers, which are designed to encapsulate the limbs with specially fitted sleeves. These pumps are designed to increase lymph flow, and blood circulation from the ankles to the upper thighs. Air-Pressure Massage enhances extra-cellular fluid clearance, reduces bloating, swelling and cellulite. It significantly decreases leg and arm fatigue and improves oxygen flow throughout the body. How long does a Pressotherapy session take? On average, a complete Pressotherapy session takes approximately 35 to 40 minutes. Based on previous experience with our clients, a bi-weekly routine is most beneficial. Every client receives their own re-usable garment (disposable) which we store for you for your future “presso” therapy sessions.